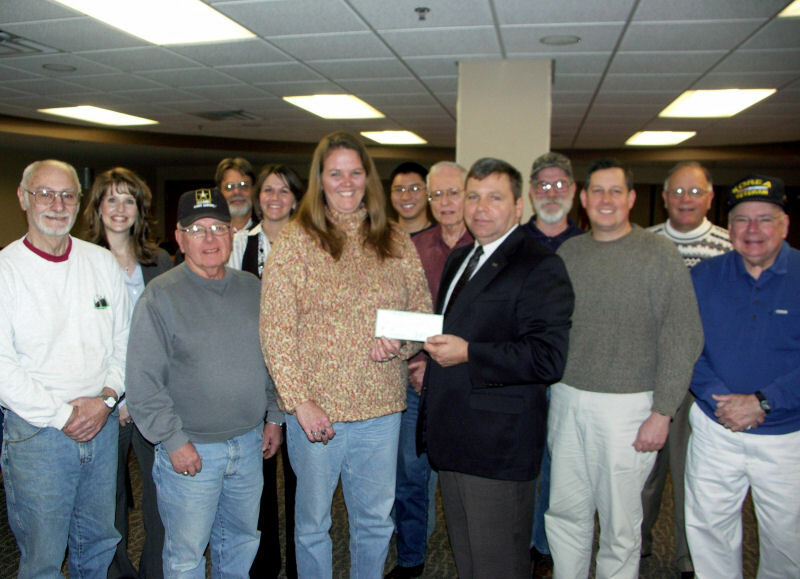 The South Central Region Veterans Group [SCRVG] which includes Regional Veterans Organizations & the Comunity-at-Large, develop, organize, coordinate & conduct promotional & fund raising efforts to establish a Veterans Memorial Park in Rolla, Missouri. Rick Morris, Chairman of Phelps for the Fort, presents a $1,000 check to Anne McClay, Chairman of South Central Regional Veterans Group (SCRVG) on Thursday, Feb. 4 at Rolla City Hall. The funds will be used for the first phase of Veterans Memorial Park, located off Southview Drive off Hwy. 72. Also pictured (l to r) are: Harrison Meaux, Chairman, Veterans Memorial Park Committee; Amanda Bell, Constituent Service Specialist, Rolla District Office of Congresswoman Jo Ann Emerson, 8th District; Jerry Bumpus, Retired Enlisted Association; Steve Hargis, Director of Public Works, City of Rolla; Stevie Kearse, Executive Director, Rolla Area Chamber of Commerce; Anne McClay, Jason Co, Engineers Without Boarders, Missouri S&T; Norman Ragan, Treasurer, SCRVG; Rick Morris; Jim Brown, American Legion; Jonathon Hines, Lt. Col., U.S.A.F., Retired; Bill Stoltz, President, Central Federal Savings and Loan; and Forest O’Neal, Korean War Veterans Association. The presentation was made during a fundraising committee meeting where several ideas were discussed to raise awareness, and identify events that will generate interest and support for the new Veterans Memorial Park. It was also decided during the meeting that the SCRVG will encompass a 16-county region in South Central Missouri. I think most of the residents of Rolla and surrounding communities who attended the Dedication of Veterans Memorial Park on Veterans Day, Nov. 11, 2009 at 11 a.m. will agree that the appropriate and well-earned recognition of our veterans, and what they have sacrificed while serving their country, is long overdo. It was heartening, to say the least, to see scores of individuals – many of whom were U.S. veterans, walk for blocks, along Southview Drive, to attend the historic park dedication services on Nov. 11. Seeing the newly paved parking lot (a $37,000 donation of materials and labor donated by Rolla Asphalt) quickly fill up with veterans and their families and friends, and 150 programs disappear in minutes, was all the proof necessary to confirm that creating and dedicating a park for our veterans was not only a good thing to do for our community, but the right thing to do for our veterans. And if momentum is a good indicator of future success, and in most instances it is, then the next phase of Veterans Memorial Park is perhaps not that far off. In fact, with the kind of grassroots support and community collaboration that exists for the completion of Veterans Memorial Park, it wouldn’t surprise me if we see many of the proposed enhancements take place in the not so distant future. During and after the dedication on Nov. 11 many individuals expressed an interest in contributing to Veterans Memorial Park both through monetary and in-kind donations, which we fortunately received from numerous businesses, individuals and organizations during the first phase of the park. If you would like to make a monetary contribution to Veterans Memorial Park, please contact Norman Ragan, Treasurer of the South Central Regional Veterans Group (SCRVG), at (573) 364-1147 or at nragan@embarqmail.com. If you would like to send a donation in the mail, please address it to Mr. Ragan at: 11995 County Road 8010, Rolla, MO 65401. For more information about the SCRVG, which played an integral role in the creation, planning and dedication of Veterans Memorial Park, please visit their Website at www.scrvg.com. If you would like to make an in-kind contribution to the park in the way of materials, equipment or labor, please contact Ken Kwantes, the City’s Director of Parks and Recreation, at (573) 341-2386 or at kwantes@rollacity.org. It was most fitting at last Monday’s City Council meeting that Councilman Stan Spadoni, a Korean War and Viet Nam War veteran, made a motion for the City to prepare a resolution to name the portion of the street on Southview Drive where the park is located, from Hwy. 72 to Winchester, “Veterans Memorial Park Drive.” His motion was quickly seconded, and I’m pretty confident the resolution will be passed so that further recognition can be given to the veterans of this area who have given so much in their selfless service to our country. Nov. 2009 - A very generous donation from Rolla Asphalt of $37,000 in materials and labor to pave the new parking lot at Veterans Memorial Park located on Southview Drive in Rolla is a testament that great things can be accomplished in a community when everyone works toward the common good for all – especially when it comes to our U.S. veterans on Veterans Day. An asphalt paving crew lead by Darren Morris and Tom Pierce of Rolla Asphalt, together with the efforts of Stacy Yoakum, owner of Yoakum Dump Trucking, repaved the large parking lot in preparation of the Dedication of Veterans Memorial Park on Wednesday, Nov. 11 at 11 a.m.
"Rolla Asphalt and Yoakum Dump Trucking stepped up to the plate not only for our Veterans whom we are honoring at the Dedication on Nov. 11, but also the entire Rolla community," said Rolla Mayor Bill Jenks, III, who will be the master of ceremonies at the Dedication on Nov. 11. "I can’t thank these two companies enough for this huge contribution to the first phase of Veterans Memorial Park." In addition to the work performed by Rolla Asphalt and Yoakum Dump Trucking on Friday, thousands of dollars more in labor and materials were donated by Capital Quarry and Smith Sand & Gravel, LLC (donation of white rock for the base); Daniels Construction Company (hauling of rock); Maggi Construction (installation of curbs, gutter and parking lot entrance) and Rolla Ready Mix (concrete for the curb and gutter). "A special thanks also goes to all of these businesses who gave generously towards the project," said Mayor Jenks. 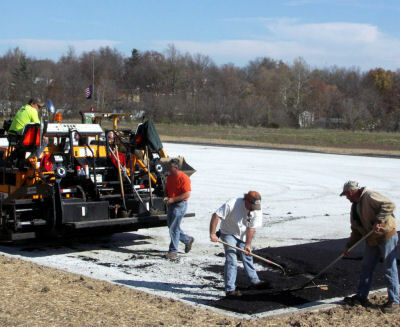 The members of the City’s Public Works Department also spent many months, and even some weekends grading and preparing the 10-acre park and parking lot. "The Public Works Department should be applauded for the outstanding job they have done to prepare the first phase of the park for the dedication on Nov. 11," said Mayor Jenks. The entire Rolla and Phelps County community, along with surrounding cities and counties, are invited to attend the dedication of Veterans Memorial Park this Wednesday, Nov. 11 (Veterans Day) at 11 a.m. on Southview Drive (located off Hwy. 72). 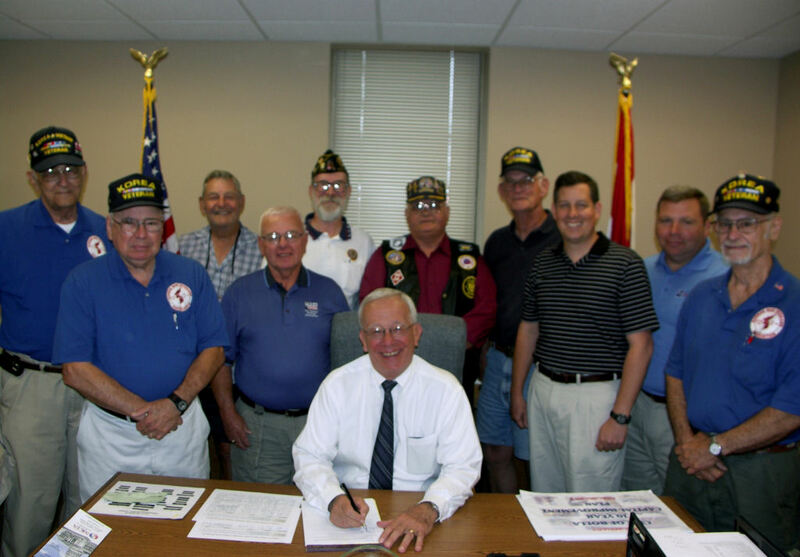 July 2009 - Mayor Bill Jenks, III met with area veterans on July 13 at Rolla City Hall during a signing ceremony for the memorandum of understanding regarding Veterans Memorial Park which is located on Southview Drive in Rolla, Missouri. The document was signed by representatives from the American Legion, Veterans of Foreign Wars, Phelps For the Fort, Missouri University of Science and Technology R.O.T.C., Disabled American Veterans, and Korean War Veterans Association. Pictured (l to r) with Mayor Jenks, a Vietnam War veteran: City Councilman Stan Spadoni, Korean War and Vietnam War veteran; Forrest O’Neal, Korean War veteran; Ken Burris, Korean War veteran; Jerry Bumpus, Retired U.S. Army and President, The Retired Enlisted Association; Jimmy Brown, American Legion 270 Representative; Paul Schuler, Disabled American Veterans Representative; Les Burris, Korean War veteran; Jonathan Hines, Retired Air Force; Rick Morris, former Rolla City Councilman, Retired U.S. Army; and Harrison Meaux, Korean War veteran and Chairman of the South Central Regional Veterans Group Committee (Scott Grahl, City of Rolla photo). 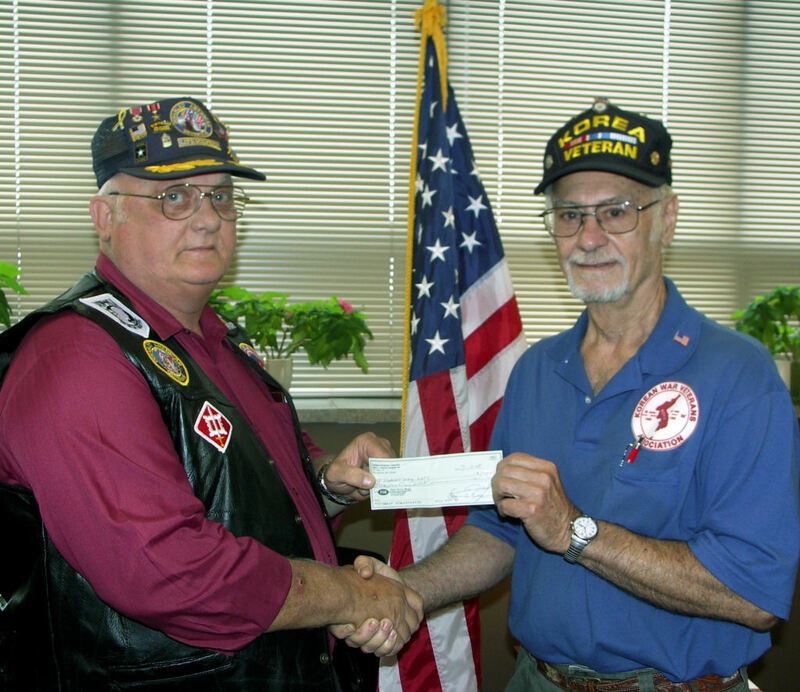 Paul Schuler, Jr., Disabled American Veterans representative, left, presents a $200 check on behalf of the Disabled American Veterans, Harry L. Herron, Chapter 49 in Waynesville, to Harrison Meaux, Korean War Veteran and Chairman of the South Central Regional Veterans Group Committee. The funds will be used for the first phase of the new Veterans Memorial Park located on Southview Drive in Rolla, Missouri.